Rome (CNN) - The cardinals who must pick a successor to Pope Benedict XVI after he steps down on February 28 could meet to make the decision sooner than thought, a Vatican spokesman said Saturday. The conclave, the meeting which will bring together the 117 cardinals of the Roman Catholic Church, could start before March 15 if all the cardinals are already in Rome, Father Federico Lombardi said. 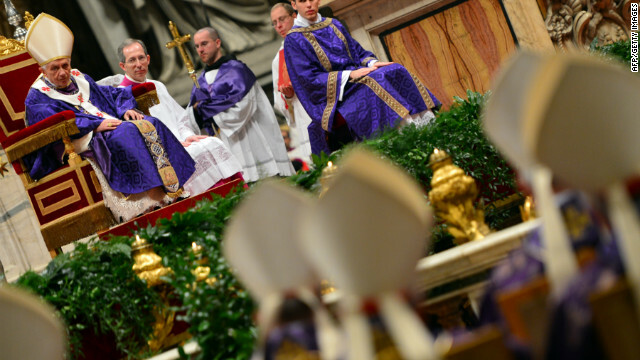 Lombardi had previously said the conclave was likely to start between March 15 and 19. But he gave new details Saturday, saying that because the pope had resigned rather than the conclave being triggered by his death, there was scope for the time frame to be brought forward. The decision may not come until after Benedict's departure and lies in the hands of the cardinals, he added. « Previous entryCould Pope Benedict be put on trial? Why should Catholic Church choose a new pope among Cardinals? We should look at ourr own history, into our own catholic roots. Catholic History shows us that we chose holy and clean man among them (monks, priest, deacon and lay people) to clean up our MESS. Instead of thinking about who will handle better international policies of the Vatican, Cardinals should re-focus which is the mission of the Church on earth. The cardinals and church leaders are too involved in policy and think like politicians. Theyneed to re-focus on the true meaning of the Church on this earth. Media is driving them on the media’s realm. They should work on returning the face of God into the Church and throw merchandise away!! We should not let the Media, private agendas determine how we feel about our Church…Don’t let the world confor you; let Christ trasnfom you (MK 16:15) We have been called to go into all the world…don’t let the world around us sqieese us into its own mould..don't let the world come into teh Church. Are they going to use the brains evolution gave them or the fairies brain ? Feb. 22, 2013 — Humans have at least two functional networks in their cerebral cortex not found in rhesus monkeys. This means that new brain networks were likely added in the course of evolution from primate ancestor to human. And no pope or cleric will be able to change this. Pope Benedict XVI and the Vatican just announced who the new pope will be!